When the Convair B-58 Hustler entered service with the USAF in 1960, it was the first jet bomber capable of Mach 2 speeds. However, nobody really knew what would happen if a pilot ejected at twice the speed of sound. Back in 1955, test pilot George Smith ejected from a North American F-100 Super Sabre at Mach 1.05. While he survived, he was very seriously injured and spent five days in a coma. At twice that speed, normal ejection seats could not be used. So engineers devised an ejection capsule for the B-58 that would fully enclose the crew and, they hoped, allow them to eject at altitudes of up to 70,000 feet at speeds of Mach 2. But they needed to test it to see if the crew would survive. 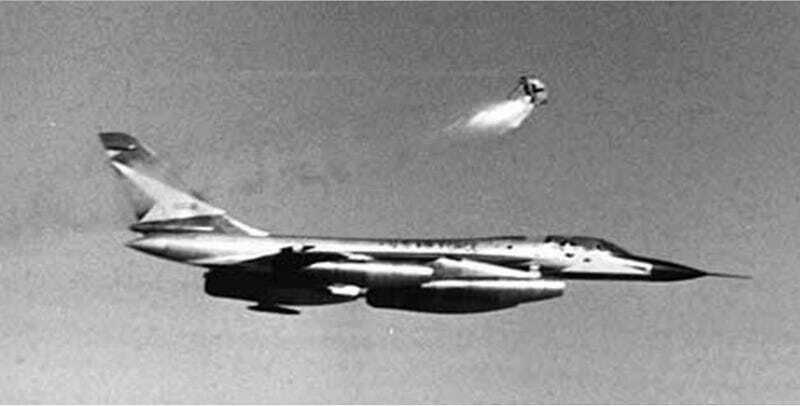 A human pilot had already done a test ejection from the Hustler on February 28, 1962, but that test was undertaken at subsonic speeds. To test the ejection system at supersonic speeds, the Air Force initiated a program to eject live, sedated black bears (and a few primates, for good measure) and then see how they fared. On March 21, 1968, a bear named Yogi was strapped in, taken up to 35,000 feet and ejected at a speed of Mach 1.3. After a nearly 8-minute descent, Yogi landed unharmed. Though the ejection didn’t kill him, Yogi was later euthanized so doctors could examine his internal organs for signs of damage. Following this initial experiment, the Air Force, along with contractor General Dynamics, carried out more tests at increasing speeds, including a ground test where a bear was ejected from a Hustler taxiing at 100 kts. The worst injury to one of the test bears was a broken pelvis, whiplash and a nosebleed when he ejected at Mach 1.6. Thanks to the service of these “heroic” test animals, the ejection capsule system was eventually certified for human use at supersonic speeds.